The average bobcat weighs 15 to 20 pounds, and is 2 feet tall and 3 to 4 feet long. The bobcat looks pretty much like a regular cat except bigger. The desert bobcat's color is a mixture of white, black, brown, and orange. The bobcat often gets confused with the mountain lion because of its fearsome growl. Bobcats can be found almost anywhere, but one of the most common places is the southwest desert. They like it there the most because of the bushy, and rocky terrain. The bushes give shade if it's hot, and the rocks are a perfect hiding spot if they're hunting prey. 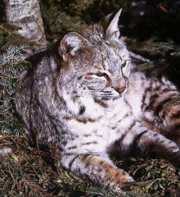 The bobcat's diet consist of rabbits, squirrels, mice, gophers,rats, and fish. They're good at catching all their prey because of their hunting ability. A bobcat's mating is a lot like a regular house cat's mating. That's one similarity that they have. Bobcats will have one litter of kittens a year. A litter of bobcats consists of 2 to 3 kittens. When food is scarce, a bobcat will not have a litter at all. When a female has kittens, she will only hunt right around her den and not use all of her hunting territory. She will wean the kittens by three months and then bring back killed animals. Once they get used to eating meat, she brings them back live prey so they can practice hunting and killing. They will stay with the mother for almost one year, leaving in the spring. Despite the bobcat's cute appearance it is actually very fierce and can kill animals as large as deer. A good thing about the bobcat is it won't kill any healthy large prey unless it's desperate. The bobcat always goes for the sick or wounded first. This is good because the sick won't spread disease to others. Bobcats are loners. Each bobcat has its own territory which it will not share with other bobcats, except for females. The bobcat's status in the wild used to be very plentiful, but too many people took advantage of that and almost killed them off. A good thing now is that the big game people are protecting them.